3-section melamine plate approximately 8.75 inches by 8 inches. Dishwasher safe (top rack). BPA free. 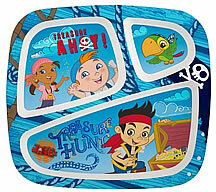 Great for little fans of Jake and the Neverland Pirates. Also great for keeping the food on the plate.